A comparative essay is an essay that aims at comparing and contrasting two or more items highlighting both similar and different points of each of them. Arguments in such an essay should be backed up with facts, statistics, and examples, so a profound research of the necessary information is required. Below you will find a comparative essay example discussing advantages and disadvantages of fast food and healthy food. In the given essay, the alternating method is used because it is possible to determine some common points of both subjects and then compare them. Fast food is considered to be an antonym to healthy food. The difference is indeed tremendous: excess and high amounts of sugar in contrast to essential vitamins, minerals, proteins, and necessary healthy fats; deep-fried way of cooking versus fresh products, steamed or baked cooking methods; and weight gain and diabetes as opposed to body tonus and energy. Facts, scientific researches, and statistics highlight fast food pros and cons, making us aware of harmful effects and dangerous issues caused by this kind of food. At the same time, healthy food is proven to have numerous health advantages and adopting healthy eating habits seems to be a really wise choice. However, one should carefully study both sides of the issue in order to make the right conclusion. When it comes to comparing fast food and healthy food, the very first thing that strikes one’s eye is the difference in quality. Fast food restaurant chains offer a vast variety of items in their menus, but the food needs to be cooked quickly for crowds of people within a short time. The single fact that the very first hamburgers in early 1900s were considered to be unsafe for consuming due to poor cooking conditions alerts that sanitary conditions of fast food establishments may be doubtful, to put it mildly . The desire to continuously attract thousands of customers results in affecting the way cattle and chicken are raised, increasing milk and meat production using genetically engineered hormone rBGH . Harmful chemicals and preservatives keep the food looking vendible, but affect the health of consumers. Fast food originated as world’s natural response to rapid economy and business development. It perfectly coincides with the common expression “Time is money”. Modern life rhythm robs people of the opportunity to spend time shopping for products and cooking. Thus, buying pizza, French fries, or burger seems to be a perfect option, especially for those who cannot boast perfect cooking skills. The convenience of fast food is undeniable. Moreover, is junk food cheaper than healthy food? Most people would undoubtedly agree with the statement. Almost everyone likes fast food smell, taste, and look. What it more, one’s favorite fast food is accessible on each continent being exactly the same everywhere. Those are definitely great advantages of fast food. On the other hand, fast food harms one’s health and causes diseases. Excess of sugar, fats, and carbohydrates causes weight gain and cardiovascular diseases. There is also a strong connection between fast food and diabetes: American Diabetes Association proves that one fast food meal contains around 1,000 calories, which raises blood sugar level, leads to Type 2 diabetes and such complications as kidney disease, high blood pressure, skin problems. Another reason for severe diseases mentioned above is high salt and sodium intake that causes 2.3 million deaths worldwide. The Centers for Disease Control and Prevention claim that fast food eaters are at risk for depression and nerve damage. There are also researches proving that fast food meat may cause Alzheimer’s disease . Some fast food ingredients, such as sodium nitrite, BHA, BHT, aspartame, trans fat, MSG , are believed to cause cancer and obesity. A serious damage is also caused by caffeine, the most commonly used drug in the world. High doses of caffeine lead to muscle weakness, heart problems, and even infertility , . Sure, there are some healthy fast food choices but out of hundreds of menu items just a few may be recommended for healthy eaters. Such disconsolate fast food facts point out the biggest fast food disadvantage – negative impact on health. Fast food lovers often claim that junk food is much cheaper than healthy food, that is why it’s so popular. Is that really so? Harvard School of Public Health (HSPH) research proved the following statement wrong. “The healthiest diets cost about $1.50 more per day than the least healthy diets. This research provides the most complete picture on true cost differences of healthy diets. While healthier diets did cost more, the difference was smaller than many people might have expected”, said the lead author Mayuree Rao. “Over the course of a year, $1.50/day more for eating a healthy diet would increase food costs for one person by about $550 per year. This would represent a real burden for some families, and we need policies to help offset these costs. On the other hand, this price difference is very small in comparison to the economic costs of diet-related chronic diseases, which would be dramatically reduced by healthy diets ”. Another thing taken into consideration is measuring the price cost per serving. According to such approach, healthy food costs less. Fast food may cost four times cheaper than healthy food but it gives twenty times less nutrition. That is more money for getting less nutrition. Consequently, price is another disadvantage of fast food if considered profoundly. Every month approximately nine out of 10 American children visit a McDonald’s restaurant . Life is too fast nowadays to waste time on cooking at home, each time coming up with new dishes. In 2016 Americans spent more at bars and restaurants (around $54.857 billion) than they did on groceries ($52.503 billion). Such fact is recorded for the first time in history. The Food Institute's analysis of the United States Department of Agriculture’s food expenditure data claims that an average American family spends 40-44% of total food money on eating out, which is almost a half. The New York Times pointed out the general loss of cooking skills among younger people. One of the reasons for abandoning cooking at home is an extreme popularity of cooking shows. It seems they should encourage the population to develop culinary skills but in fact is acts quite vice versa. Such shows create an impression that it is impossible to cook professionally, fast, and tasty, so it is better to buy ready-made food that someone really professional has cooked rather than wasting time and efforts on meaningless attempts. “We are what we eat”, as the saying goes. One’s health depends much on the type and amount of food being consumed. 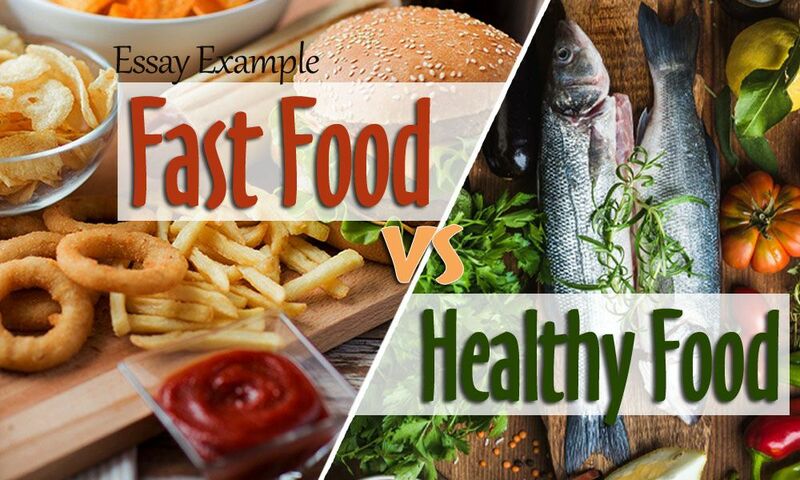 Fast food vs. home cooked, eating in vs. eating out, being careful and attentive to what you eat vs. being indifferent - it all affects the general state of the body. Healthy food provides an organism with essential vitamins and necessary nutrition, keeping the body in shape and preventing diseases. In contrast to healthy food, fast food harms an organism, contaminates it, and leads to serious complications, sometimes even fatal ones. As a conclusion, the level of physical activity and nutrition are the two things that determines the lifestyle of a person, which in its turn identifies the quality of life itself. Mayuree Rao, Ashkan Afshin, Gitanjali Singh, Dariush Mozaffarian. Do Healthier Foods and Diet Patterns Cost More Than Less Healthy Options? A Systematic Review and Meta-Analysis. Boston, MA: BMJ Open, December 5, 2013. Smith, Andrew F. Encyclopedia of Junk Food and Fast Food. Westport, CT: Greenwood Press, 2006. Spurlock, Morgan. Fast Food and the Supersizing of America. New York, NY: Penguin Group (USA) Inc, 2005. Waldman, Murray (M.D.) and Marjorie Lamb. Dying for a Hamburger: Modern Meat Processing and the Epidemic of Alzheimer’s Disease. New York, NY: St. Martin’s Press, 2004. Block method (the first part of the essay focuses entirely on subject A, while the second one is developed around subject B). Right drinks choice (drinking water, black coffee, no soda or sweetened coffee). Burger King’s Egg & Cheese CROISSAN'WICH (vegetarian).